The consumption of turkey ham has been increasing considerably. This product can be marketed sliced, and thus, it is subjected to intense manipulation and presents a high microbial load, which compromises its quality and safety. The objective of this study was to characterize microbiologically vacuum-packed and conventionally packed sliced turkey hams marketed in Mossoró, state of Rio Grande do Norte, Brazil. The analyses consisted of mold and yeast, viable aerobic mesophilic microorganism, and coagulase positive Staphylococcus counts, determination of the most probable number of total coliforms and thermotolerant coliforms, and presence of Salmonella spp. 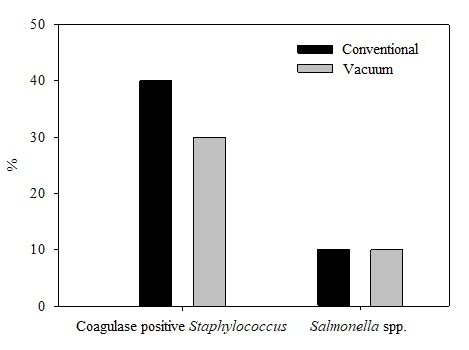 Turkey hams present high microbiological counts regardless of their packaging, but conformity for coliforms at 45 °C. Some samples had low quality, denoting that a greater care in the manipulation and conservation of this product is necessary to ensure the safety and absence of risks of this product to public health.